I feel uniquely qualified to examine the phenomenon that is Pokémon Go through the lens of an outdoors adventure publication. On the real-world side, I’ve been covering the outdoors for 20 years and have written two Colorado based hiking guides. And on the real-nerd side, I still own my original copies of Pokémon Red, Blue, and Yellow where indeed, I caught them all. Oh, and I also have played through Pokémon Emerald, Sapphire, Black, White, Black 2 and White 2. Never you mind that I’m 40 years old. As an oddball hybrid writer who loves the outdoors as much as gaming, I’m intrigued to see the augmented reality of Pokémon Go ever-so-slightly toe its way into realm of adventure sports. If you’re not familiar with the game, it’s a smartphone-based app that uses geolocations in the real world to locate assorted monsters. Those playing the game have to set out in the actual, honest-to-goodness, not-virtual world to capture the titular critters. It’s more or less geocaching light, with a prize of virtual monsters in lieu of physical rewards. It’s not exactly like running an Ironman, but hey, it’s getting people some exercise and folks are having a lot fun with it. I can already feel the frowns of the cranky, blaspheming the very notion that Pokémon have any place in the pristine retreats of nature. To blow off steam, they’ll head off into the wilderness using Google maps, switching on Strava, and posting their adventure on Facebook. So it goes. Technology has always had a way of making enemies in the outdoors. Just name the sport and you’ll find a whole bunch of scowling curmudgeons who insist you’re wrong and you’re stupid for not doing something the way they do. Among the crustiest are climbers who still feel cams are cheating, cyclists who feel like you’re a sub-species for not riding a single-speed, hikers who despise those who prefer GPS over map and compass, climbers (again) who insist gym climbing isn’t real climbing, and finally, the royalty of get-off-my-lawn, why-are-their-pants-so-baggy old farts, telemark skiers. “You’re doing it wrong” seems to be the war cry of those who forget that the majority of people are out there to have something called “fun”. Of course, I realize that most people enjoy the outdoors on their own terms and that a lot of these notions are overblown, but spend enough time in Colorado and you’ll eventually meet living, breathing, cranky stereotypes. Apparently I’m friends with most of them online. Maybe it’s just the slice of my outdoors-based social media, but a lot of self-proclaimed outdoorsy-types have amped up to YouTube-style comments of belittlement of Pokémon Go, complete with all-caps rants and misspellings galore. While I can’t explain why it bugs so much of the human race when other humans find something enjoyable, I will say I wouldn’t be surprised to see some of the augmented reality aspects of the popular app integrated into outdoors applications. Starting from the first GPS units all the way to Strava leaderboards, I have always been a fan of blending technology, game-like data, and the outdoors. I also completely understand why some people have no interest in these things. What I don’t understand is why they make some people furious. 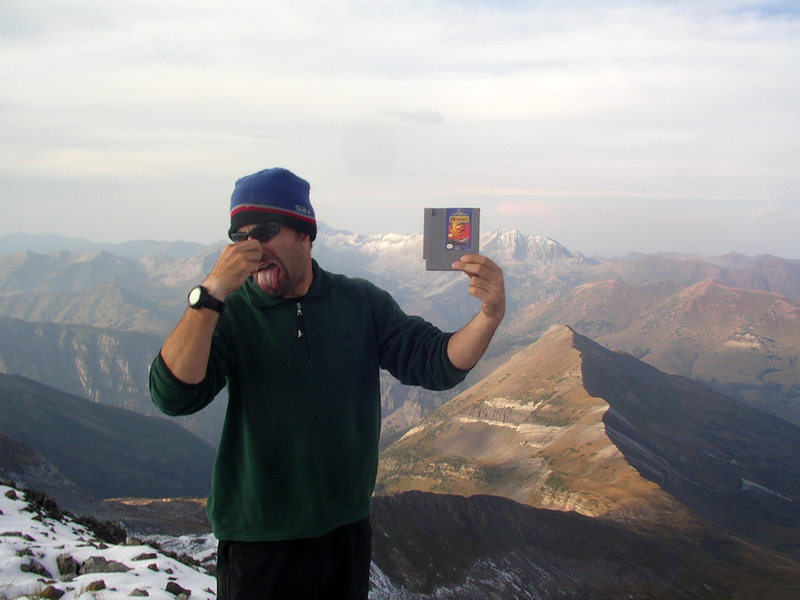 The author holding the worst Nintendo Entertainment System game of all time, Heroes of the Lance, on the summit of Treasury Mountain. In the past year, I’ve finally been able to enjoy the benefits of Strava, thanks to upgrading my smartphone. It’s a good training tool, I like to challenge my own times, and it’s fun to compete with friends. And yet, I’ve gotten the oh-so-helpful feedback that I’m an idiot for using it and that it’s “ruining” my outdoors experience. Look, I live in Boulder, Colorado, a place so dense with professional athletes and type-A near pros that I have no illusions of ever dominating Strava’s cherished leaderboards. That doesn’t change the fact it’s cool to see all my stats at the end of a ride or run and to strive to improve a bit more each time out. The primal human brain thrives on competition, especially against itself. Great article James! No reason technology can’t be used to make the outdoors more accessible and fun for everyone. Love your perspective. I’m with Warren Harding, circa ‘Downward Bound’ – do everything to discourage as many as possible from overrunning the finite, fragile resources we have left. Make it clear that going out of doors might change your life, but not always for the better, and folks need to respect nature, and one another. It’s grand, but not convertible into playground unicorns or bitcoins. “Virtual” anything = virtual nonsense, instantly boring, trivial, mind-numbing. Some Brooklyn teens visited me in the 1970’s, drank six-packs for breakfast and left Boulder after three days, because “there’s nuthin to do here”. Same difference, now there’s an app for them. These tech crutches are worse than drugs, back in the LSD era – at least then the kids earnestly hoped to expand their consciousness, opening it to the cosmos.